This artist's illustration gives an impression of how common planets are around the stars in the Milky Way. The planets, their orbits, and their host stars are all vastly magnified compared to their real separations. According to a recently completed statistical study by an international team of astronomers, our galaxy has at least 100 billion planets. 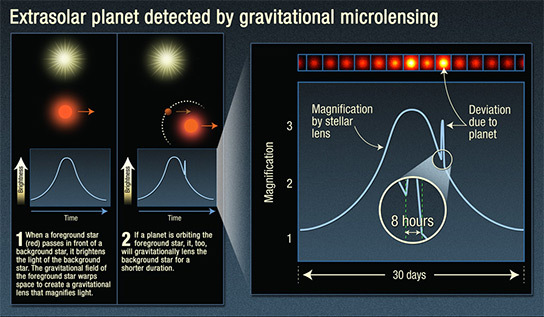 Gravitational microlensing was used to detect planets, and it was discovered that on average there is at least one planet for every star. From the data there are are more than 10 billion terrestrial planets in the Milky Way and more than 1,500 planets within 50 light-years of Earth. 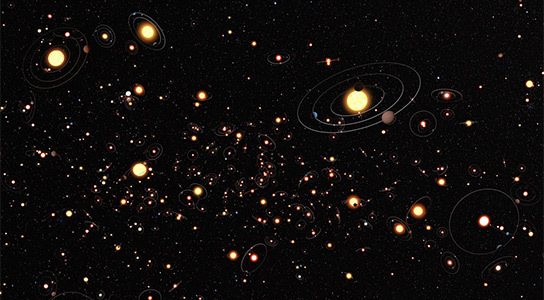 The team’s conclusions are gleaned from a planet search technique called microlensing. The technique takes advantage of the random motions of stars, which are generally too small to be noticed. If one star passes precisely in front of another star, the gravity of the foreground star bends the light from the background star. The higher the mass of the “lensing” star, the longer is the duration of the microlensing event. Typical microlensing events due to a star last about a month. But the extra brightening due to a planet typically lasts a few hours to a couple of days. Using the microlensing technique, astronomers can determine a planet’s mass. This method, however, does not reveal any clues about the world’s composition. Of the approximately 40 microlensing events closely monitored, three showed evidence for exoplanets. Using a statistical analysis, the team found that one in six stars hosts a Jupiter-mass planet. What’s more, half of the stars have Neptune-mass planets, and two-thirds of the stars have Earth-mass planets. Therefore, low-mass planets are more abundant than their massive counterparts. “This means, statistically, every star in the galaxy should have at least one planet, and probably more,” said Sahu. These results are independent from a gravitational-lens survey led by Takahiro Sumi of Osaka University in Japan, which estimates there are hundreds of billions of planets with orbits larger than Saturn’s orbit, or are free-floating throughout the galaxy. Be the first to comment on "Milky Way Galaxy Has Over 100 Billion Planets"